Who’s that galloping thoroughbred who just raced by NFL’s elite defensive players for a 56-yard touchdown? Colin Kaepernick came out of nowhere to capture the attention of America this season. At 25, he’s just in his second year in the NFL, has only started in nine games—yet he’s taking his team to the Super Bowl in New Orleans on February 3, 2013. The York and DeBartolo families are already dreaming of their second 49ers dynasty. But we shouldn’t be so surprised. As a nine-year-old fourth grader in Turlock, California, Colin wrote a letter to himself foretelling his future with the 49ers. 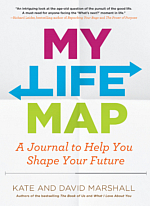 This entry was posted in Life Planning, My Life Map on January 31, 2013 by Marshall Books.